According to Little, qualities of a “perfect surgeon” include attitude, aptitude, ability, ambition, adaptability and humility. Humility is the ability to say, “Sorry, we got it wrong,” or “Sorry, I don’t know,” he said. 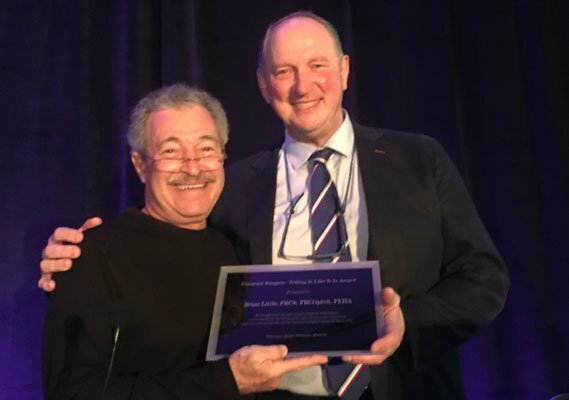 Robert H. Osher, MD, Cataract Surgery: Telling It Like It Is course director (left), presents the International Guest of Honor Award to Brian Little, MA, DO, FRCS, FRCOphth, FEHA, of Moorfields Eye Hospital. Additionally important are cognitive and interpersonal technical and non-technical skills. “The cognitive skills are the process that we use when we are basically evaluating what is going on around us — gathering information, assessing the situation,” he said. One identifies the options and chooses the best one. Equally important is how one reacts under pressure. “Success hinges on how we react to failure,” he said. Little suggested that surgeons need to acquire cognitive skills, such as information gathering, situation assessment and decision making, similar to how pilots use flight simulators. Little B. International guest of honor lecture. Presented at: Cataract Surgery: Telling It Like It Is; February 6-10, 2019; Orlando. Disclosure: Little reports no financial disclosures related to this lecture.